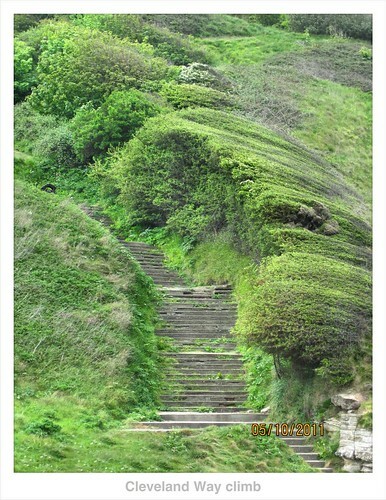 Today was our planned hike along the cliff tops from Filey to Scarborough. By road there is only 6 miles separating the two towns but following the Cleveland Way route along the cliff tops increases that distance to about 10 miles. 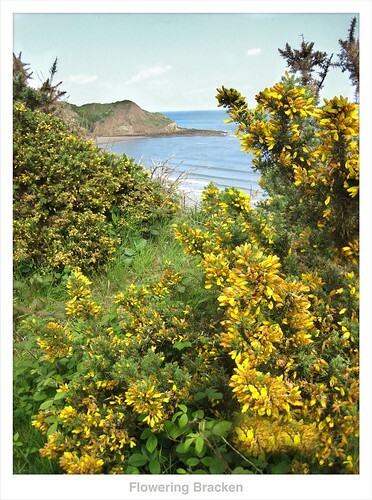 We left the house around 10 am and headed to Filey Brigg right away before turning north along the dirt and grass trail passing by the Flower of May caravan park and the surfing shop at Cayton Bay. We stopped for a little lunch on an old WW II cement bunker near Cayton Bay. 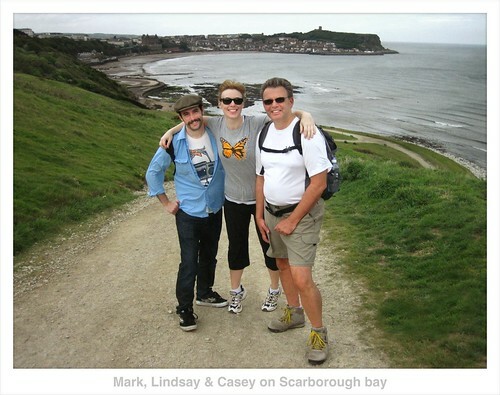 The last time we were in Filey, Chris & I ate lunch on top of this same bunker during our walk to Scarborough. Today we could see evidence of what cliff erosion has done over the years to the bunker as a portion of it was now hanging in mid air where some of the cliff had fallen away. We sat on the portion still well anchored into the cliff for a few minutes to eat our sandwiches before pushing on to Scarborough. 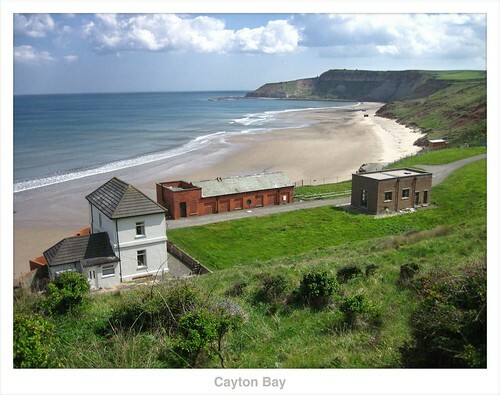 Who knows if that bunker will still be on the cliff or laying on the beaches of Cayton Bay below on our next visit. We continued on into Scarborough as Cleveland Way eventually led us down to the beach and past the old spa on the seafront. If memory serves, many years ago there used to be a tidal salt water pool at the spa that used to fill up at high tide and slowly drain as the tide receded. Once into Scarborough we climbed our last set of stairs from the beach all the way up to Huntris Row for our well deserved afternoon tea and scones at Thornton’s at around 2:30 pm. Chris’s iPhone app, RunKeeper Pro, tracked our progress all the way from home…..our grand total was just over 16 km or 10 miles ….not a bad day of exercise. We made a quick run through Boots and Brunswick Centre before heading for the train station and the short train ride back to Filey. We were back at home around 5:30 pm and enjoyed my mother’s cauliflower pancakes for supper. We’ve been begging for pancakes since arriving in Filey and they were FANTASTIC!! It’s an old German Schwabian recipe consisting of 8 inch diameter, thin almost crepe like, pancakes with hot cauliflower and a white sauce with a sprinkling of Parmesan cheese and some maggi for seasoning. My mother cooked pancakes while we wolfed down two pancakes each. Fabulous! Our time with the kids in FIley is slowly winding down. We have a driving tour through the Yorkshire Moors planned for tomorrow. Tomorrow is also our last night at Hallam Guest House B&B in Filey. We have really enjoyed our stay here. Hallam is great budget level accommodation and Sam & Chris have done a wonderful job preparing breakfast for us every day, really top notch. Very clean & comfortable, with great food at a great price! Can’t ask for anything better than that. This entry was posted in Entertainment, Photography, uk. Views like that make that hike "high entertainment value" in my book. I'm with Dennis and Donna … would love to have that recipe for cauliflower pancakes. LOL so true Dennis and Donna… how funny… Sounds like your eating good – smiling good which makes for good living – Right On! !